A Family favourite, I grew up eating these. My friends call them cheesy pillows, but for me they are just Gougére. They are really easy and seem to impress people, you can cook them for a tiny bit longer to make them firmer so you can fill them with a fish pie filling for with a cheesy leek filling for those vegetarians amongst you. To be honest I love them just on there own (sometimes tomato ketchup). Something always seems wrong when a recipe tells you to boil a fat (in this case butter) with water, but it turns out amazingly. Do let it cool properly before you add the eggs, it always looks like they are not going to mix in, but they always do, just work the mixture. *I always add a pinch of curry powder to bring out flavour of cheese. Away from heat shoot in flour all at once and beat until smooth. When smooth and cool, beat in two eggs a little bit at a time, then mix in cheese. At this point you can store the mixture till needed in fridge (up to 2 days). Pipe or spoon mixture into small balls onto greased baking tin, put into oven for 15-20 minuets. I do like simple cooking, I do mess with the recipe by trying different cheeses and sometimes I add and extra egg and cheese to get a heavier and cheesier centre (e.g. not for stuffing). I also sometimes put some pre-roasted garlic in. To me this is the one of the points of cooking, the experimental process, I was rubbish at science. However, the process of cooking is my science. nice! 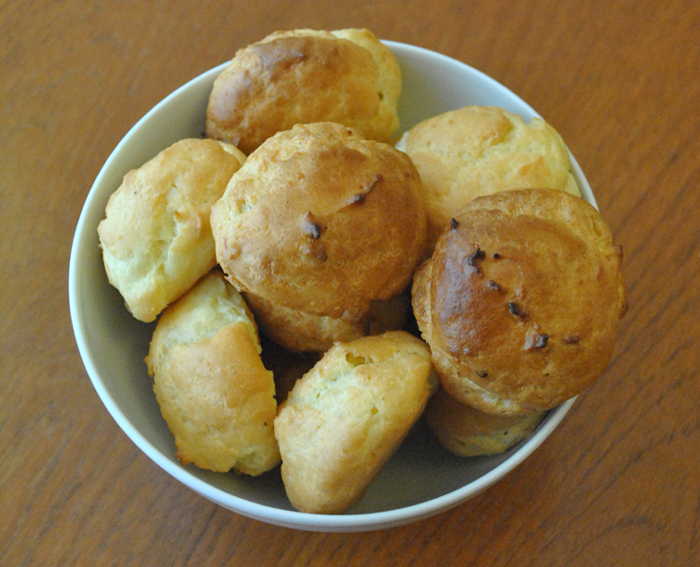 Choux pastry always sounds a bit of a faff in recipe books, but this sounds relatively easy!